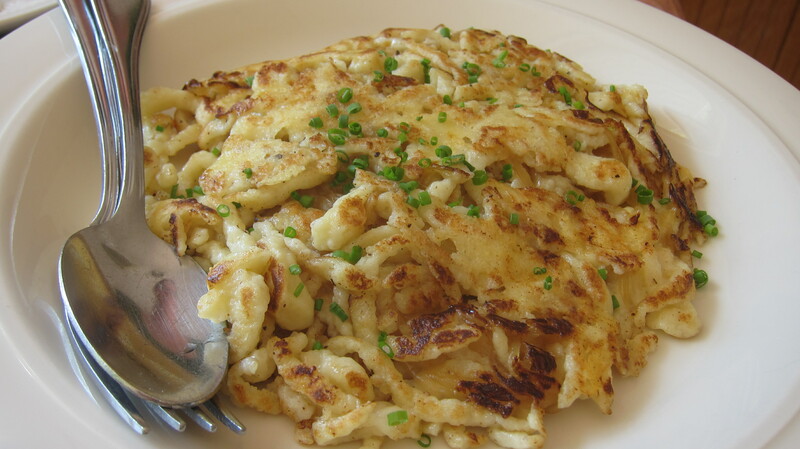 Sauteed spaetzle with caramelized onions and Emmental cheese. Yes, please! While Portland has an eclectic and vibrant local food and restaurant scene, something that has been noticeably missing is Central European fare. I recently went to Karl Ratzsh’s on a recent trip to Milwaukee and it made me realize how much I was missing – I needed more beets, spaetzle and bratwurst in my life. There are also several starters, including beet, barley & vegetable soup and potato pancakes with homemade apple sauce and sour cream (why I didn’t get that second option, I don’t know. I’ll be back). You can also have the potato pancakes with house cured lox, horseradish sauce, capers and cornichons (gherkin pickles). There are also a number of sides to complement your main dish. 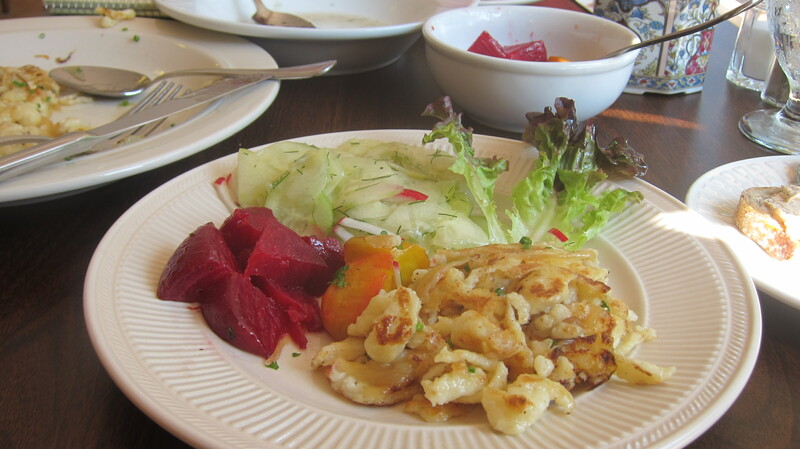 Claire and I decided to share a plate and two sides – we opted for the sauteed spaetzle and sides of roasted & golden beets and cucumber salad with fresh dill & vinaigrette. We were not disappointed – it was the perfect amount of food to share. 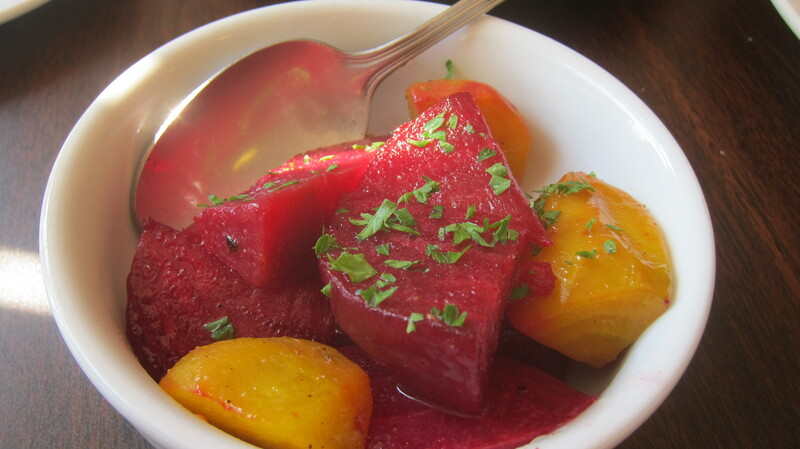 The beets were well cooked and warm. 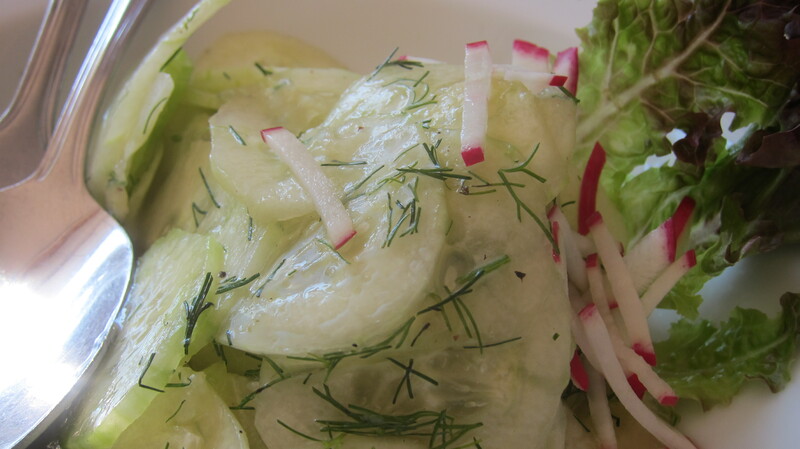 The cucumber salad provided a lighter side to the meal. But of course, the highlight of the meal was the spaetzle. Amazing. We ended with dessert – they offer a single dessert that changes each day. 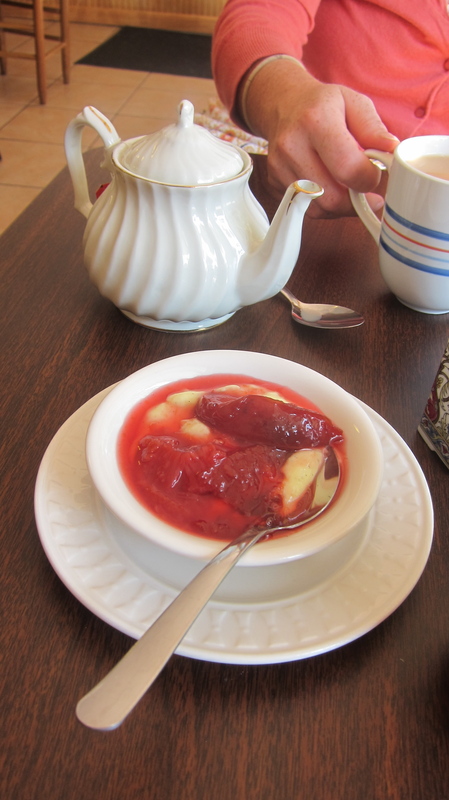 The day we went the offering was vanilla custard with plum compote – and you could see the vanilla beans in the custard. Paired with a cup of tea, it was a sweet way to end the meal. 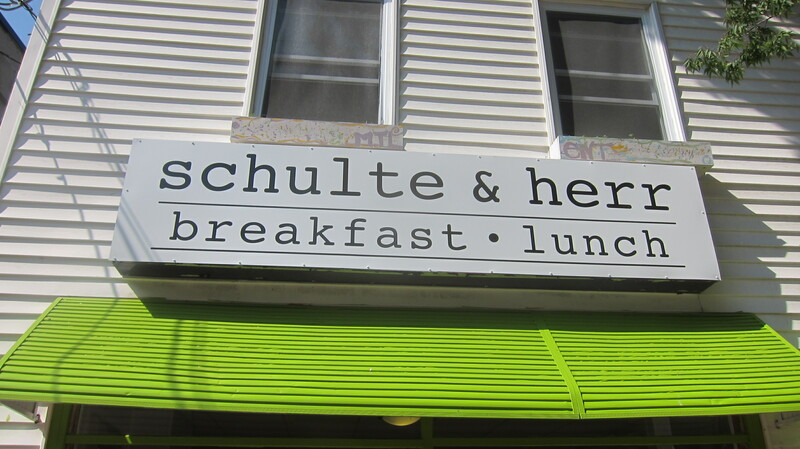 Schulte & Herr (349 Cumberland Avenue) is open for breakfast (that will be the next review!) and lunch, Monday – Saturday, 8 am to 3 pm. 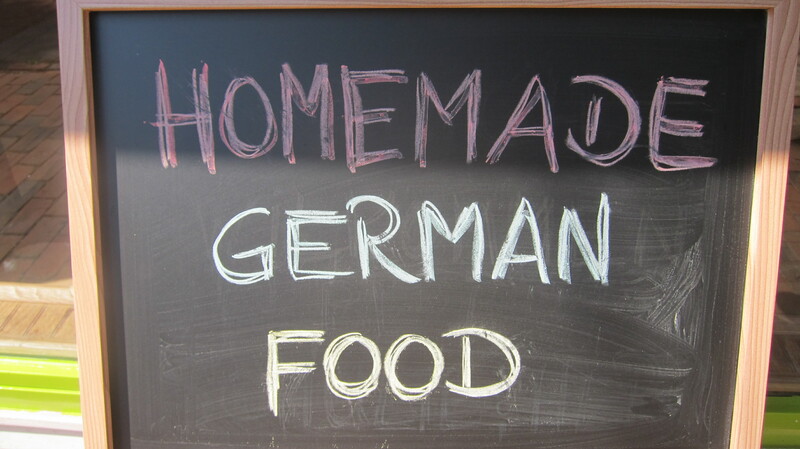 This entry was posted in Food & Cooking and tagged beets, Central European Food, Cumberland Avenue, German Food, golden beets, Karl Ratzch's, Maine, Portland, Portland Restaurants, Schulte & Herr, Schulte and Herr, Spaetzle. Bookmark the permalink. I am not that familiar with German food but I am very excited to try this place. It looks and sounds so yummy! Thanks for posting this. I love learning about be places in the area. Thanks, Ashley! I think you will like it – I really want to try breakfast there, too. I might be in trouble, since it’s right next door to my workplace! The flavors and aromas are simply too good to describe. Breakfast was filling and sweet and savory in the form of a light, crispy Belgium waffle served with sausage. My sister had the omelet filled with potatoes and onions. All were served with a basket of made on site rye and toasted white breads. Lunch was over the top delicious starting with the Vegan Beet, Barley veggie soup, followed by shared dishes of carmelized spaetzle, roasted red and golden beets, German potato salad, and potato pancakes served with home made apple sauce and sour cream. This is what home made food should look and taste like. This is food cooked and served with the respect it deserves. Awesome. I can’t wait to go there the next time I’m in Portland. My mouth is watering thinking of the beets and the potato pancakes. The picture of the custard with plum compote reminded me of a dessert my mother made years ago. Thank you for bringing a much-needed German restaurant to the Portland scene, and thank you Mainebelle for bringing it to our attention. Sounds so good. My German husband will be very excited to try this place. Any word on if they plan on opening for dinner soon? I haven’t heard anything about dinner, I think they are trying out different approaches right now – dinner there would be fantastic! Schulte & Herr is great. the waitress was really, really nice and helpful. the food was outstanding. my wife and i had a breakfast of German Omelette, with toast and sausage. everything was prepared without an over load of salt and butter and greese. We could taste all the different ingredients individually in every bite. Its the best breakfast i’ve had at a restaurant in a very long time. We also inquired about where they get their sausage from, which turned out to be at the Sausage Kitchen in Lisbon Falls (www.sausagekitchen.com). We have sense gone to the Sausage Kitchen to get more for home. Schulte & Herr is great, I wish the owners/workers the best of luck, and you can bet we will be back. Hi Derek, I’m glad you enjoyed it! I have yet to go for breakfast, but it’s on my to do list this week! S&H opened for their first brunch today and they are offering a roasted meat special every Sunday. Today they prepared sauerbraten, which they described as “marinated for three days and roasted for three hours.” The beef was tender and the brown gravy accented with raisins and ginger (perhaps ground gingersnap cookies). The dish was served with sweet and sour red cabbage and potato dumplings. So good it almost made me cry. Hi Ronaldo, thanks for the update! I will definitely be there next weekend!